While the installation of hardware at Chilbolton was completed this summer, the LOFAR-UK station is still in a commissioning phase where data quality is being checked, and the full data link to the LOFAR supercomputer at Groningen (in the Netherlands) is being established. The Chilbolton LOFAR Radio Telescope has two modes of operation, standalone and remote. Remote operation will see the radio telescope controlled by ASTRON in Dwingeloo and data sent to Groningen. Standalone operation (which is already happening - more on that soon) sees the telescope controlled from Chilbolton and the data stored locally. Data rates from a LOFAR station under remote operation can be over 20-30 TB (that's tera bytes) a day, which is equivalent to about 5000 DVDs. So as you can imagine this kind of data cannot be sent over the normal internet lines and a dedicated path is required. In fact a 10 Gbps (giga bit per second) connection is one of the contracted requirements between LOFAR-UK and ASTRON for hosting a LOFAR station at Chilbolton. Linking Chilbolton to the Netherlands with this dedicated 10 Gb/s connection (equivalent to adding 100,000 broad band internet users in the small village of Chilbolton in rural Hampshire) turned out to be quite a challenge for LOFAR-UK with a significant amount of effort going into researching the best options (and not to mention that it dominates the cost of the telescope!). 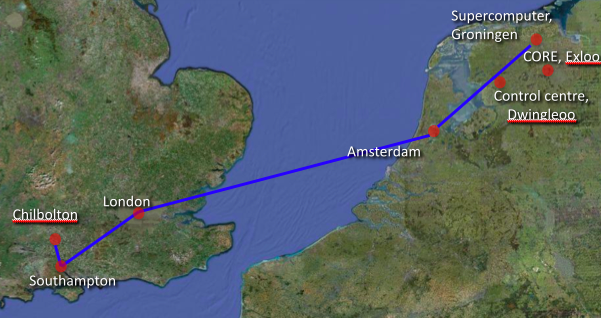 The main challenge actually was to get the data to London from where a fast link to Groningen was relatively cheap and easy. Multiple routes to London had to be considered, the main two being via Southampton (to the south of Chilbolton), or via Reading (to the north). Going via Southampton might looks a bit like going in the wrong direction, but it reduces the number of intermediate service providers, thus keeping the cost low. 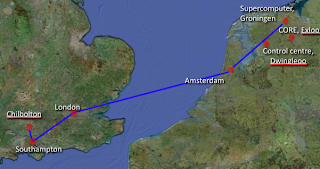 why the first connection over the full 10 Gbps link to Groningen (which occurred early last week, with the first full-capacity transmission taking place yesterday) is a significant milestone for LOFAR-UK and something we have all been celebrating. Throughput tests are currently being conducted and we hope to be able to establish the first data transmission very soon.